Manchester United entertain Arsenal at Old Trafford on Sunday in what could be a crucial game in determining where the title ends up this season. Arsenal head into the game sitting eight points clear of United so could put a huge dent in the champions title defence if they could come away with three points this weekend, whereas the hosts could put themselves right back in the title mix if they could end the Gunners 9-game unbeaten run. David Moyes confirmed on Friday that Danny Welbeck will miss the game but he’s hopeful that the likes of Rafael, Michael Carrick and Jonny Evans could return to the squad. Rio Ferdinand played alongside Nemaja Vidic in defence during Tuesday’s 0-0 draw with Real Sociedad and could continue their partnership on Sunday, while Michael Carrick could also return after missing the last two games through injury. Robin van Persie is expected to face his old club and will be partnered by Wayne Rooney up front while Adnan Januzaj and Antonio Valencia will hope to retain their places on the wings. Arsenal come into the game off the back of an impressive 1-0 win over Borussia Dortmund and Arsene Wenger is likely to stick with the same eleven players who won out in Germany. The only two players who could return from injury are Jack Wilshere and Mathieu Flamini. Wilshere is struggling with an ankle injury while Flamini has missed the last three games with a groin strain. However, the pair trained on Friday and Wenger confirmed he will make late decisions over the duo, but is confident Flamini will be available. Whether he’s recalled to the starting line-up is another question though, as it will be difficult to drop any of the players who featured against Dortmund. Theo Walcott, Lukas Podolski and Alex Oxlade-Chamberlain all remain out, although Walcott is expected back after the international break. What do you think of our teams? What would your be? Share your views below. 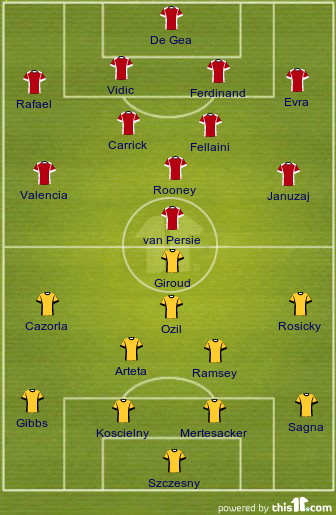 Mr moyes…..i wnt dis line up dg,rafeal ,vidic,evans,evra,carrick,cleverly r jones,valencia junijaz,rooney,v persie…..Up united!!! The regin of fergoson has been berried en this is moyse time. So lets see how technice he ve to play against us.